Boy Scout Motto: “Be Prepared”. Historic Downtown Fremont Motto: Better to be safe then sorry. 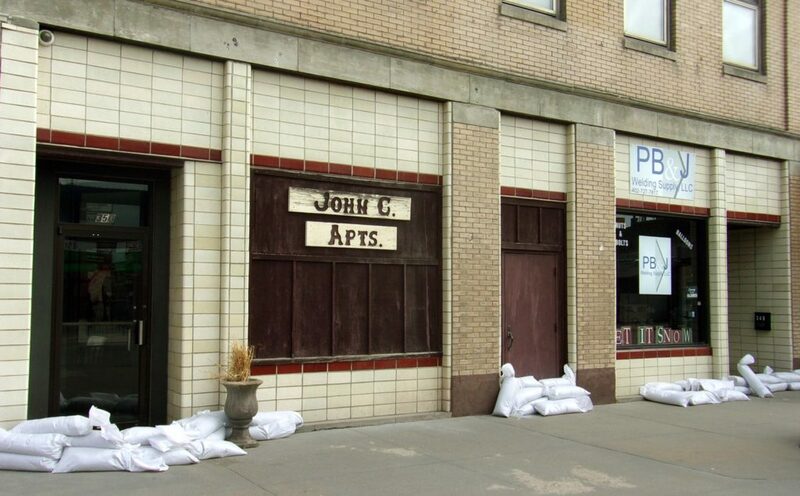 March 16th, the word went out that there was a possibility of the flood waters reaching the downtown area. 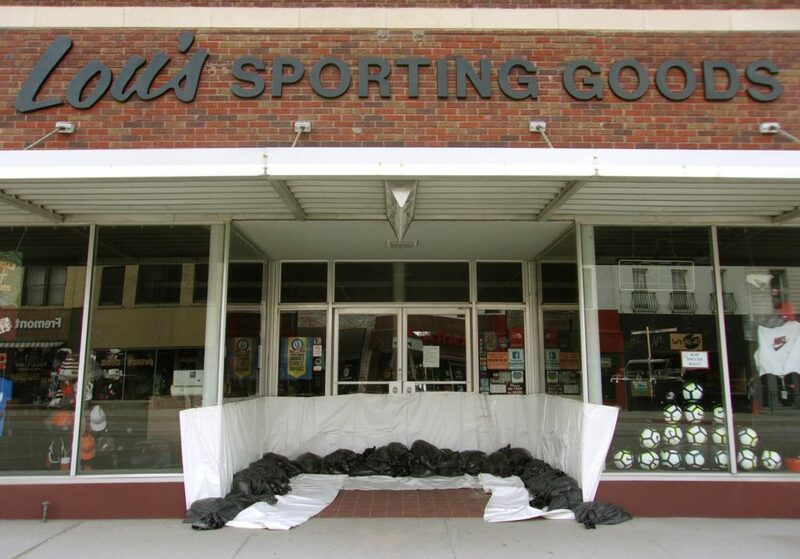 Local shop owners took the warning and prepared their front entrances. The ‘All Clear’ was given on Monday that the threat was over and that the city was doing a great job in redirecting the flood waters away from the city. Standing as tall as this grand old Downtown Fremont building is one of the class acts of our Historic business community, Mr. Kirk Brown. 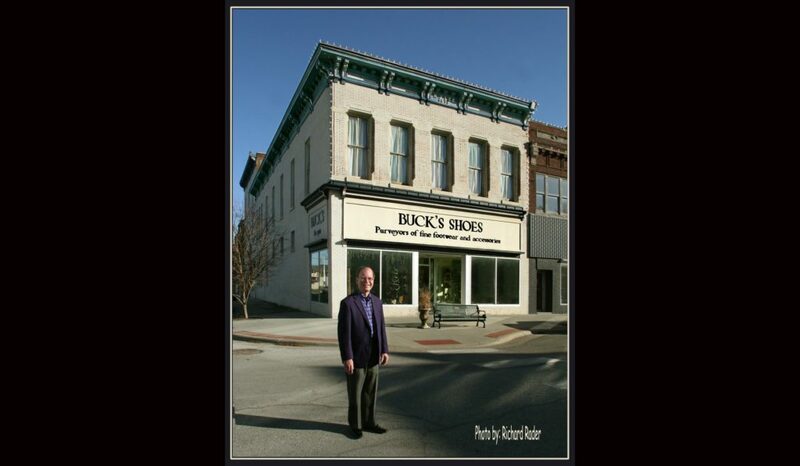 By now we have all been given some small bit of the news that Buck’s Shoes will soon stop selling and start closing it’s doors for good. Soon, very soon the discount sale will begin. A letter has been sent to Bucks supporters and then the wall to wall liquidation will be open to all. 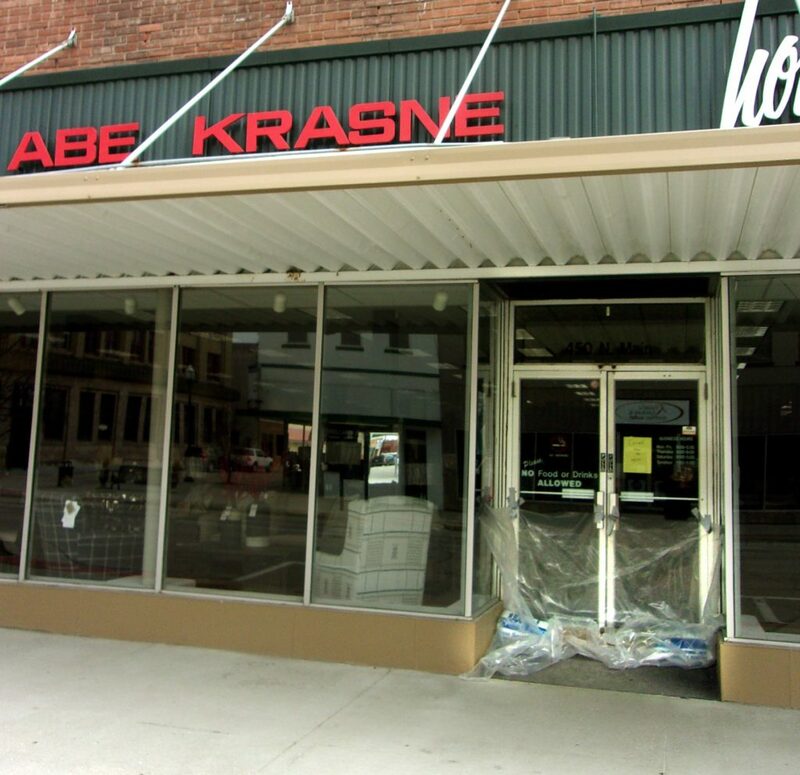 As in all things changing, nobody knows what’s next for Kirk and Molly Brown and nobody knows what may be in store for the property at the corner of 6th and main street in Historic Downtown Fremont, Nebraska. Good luck and God bless. Join Us! For our All-Inclusive Downtown Discussion on Tuesday, March 19th. Pizza and beer at 5:30 pm, Discussion starts at 6:00 pm. Over 200 invites went out to building owners. We will be hand delivering those businesses that don’t own the building they occupy. If you do not personally receive one of these cards and you are reading this blog post, consider yourself invited. 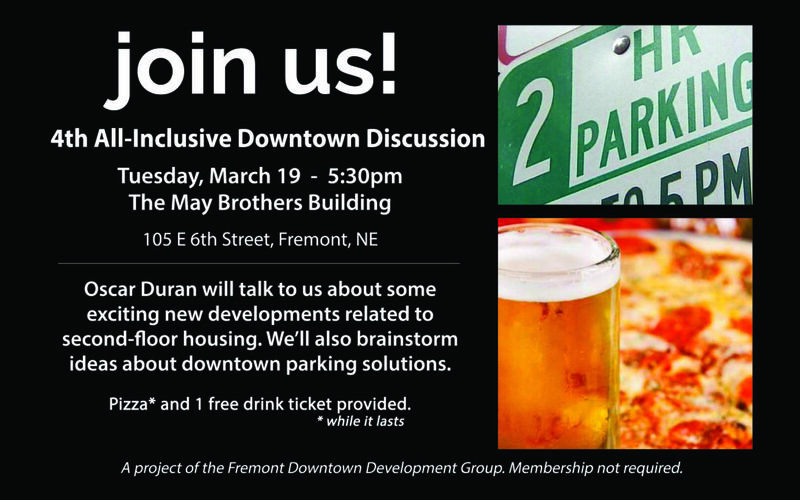 Anyone with a love for downtown Fremont is welcome to attend. Over 200 invites are hitting the Post Office today. Expect yours soon. We will be holding our quarterly Downtown Discussion on December 4th at 6:00 pm. 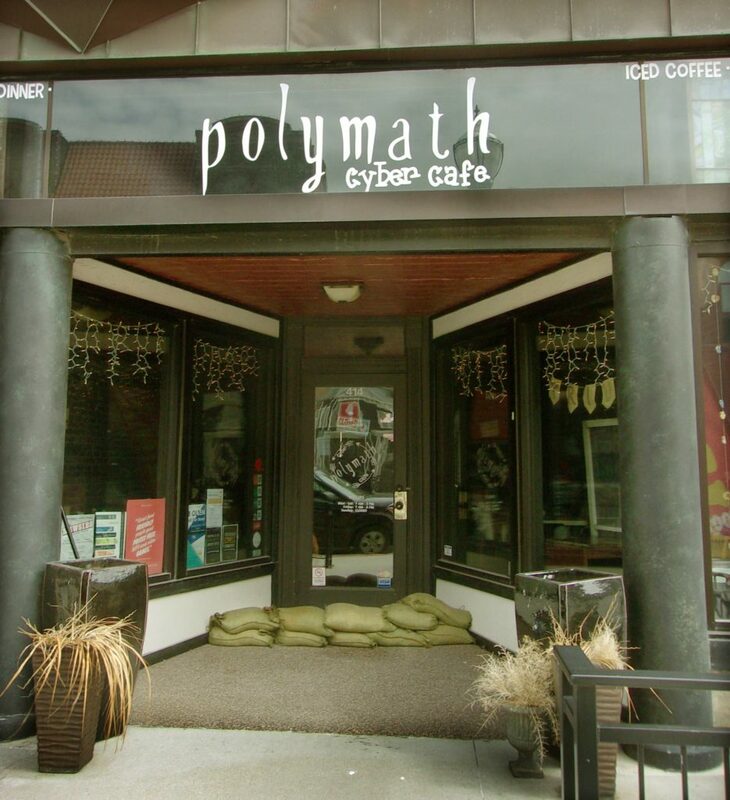 We will be offering Small Business Social Media training at 5:00 pm for those who would like to participate. Pizza and drinks will be provided. We invite everyone who has a love for our downtown to attend and join in on the discuss. This is a public forum, so all are welcome and please be sure to invite a friend to come you. The paperwork is just about ready to be filed and the Fremont Downtown Development Group is well on its way to becoming an official Nebraska 501c3 nonprofit organization! While we wait, we will continue to focus on transforming downtown Fremont into an area bustling with shops, restaurants, and activities—welcoming neighbors, friends, and visitors to our beautiful city. We want to give a huge shout out of thanks to the Fremont Area Community Foundation for agreeing to be our fiscal sponsor until our 501c3 paper work is approved. 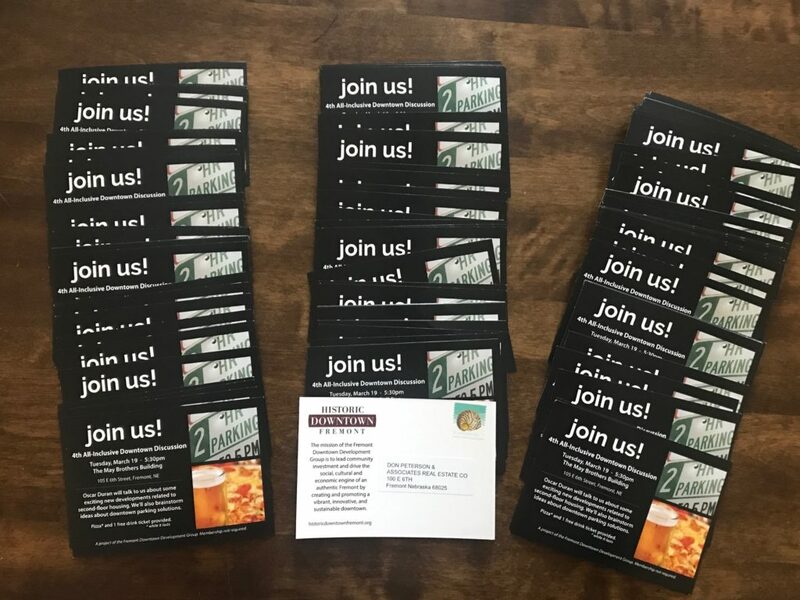 Their fiscal sponsorship means donations can be made to the Fremont Downtown Development Group through the Fremont Area Community Foundation. We currently have one project receiving funds: Lights On Fremont! is our initiative to outline all the buildings in downtown with white lights. 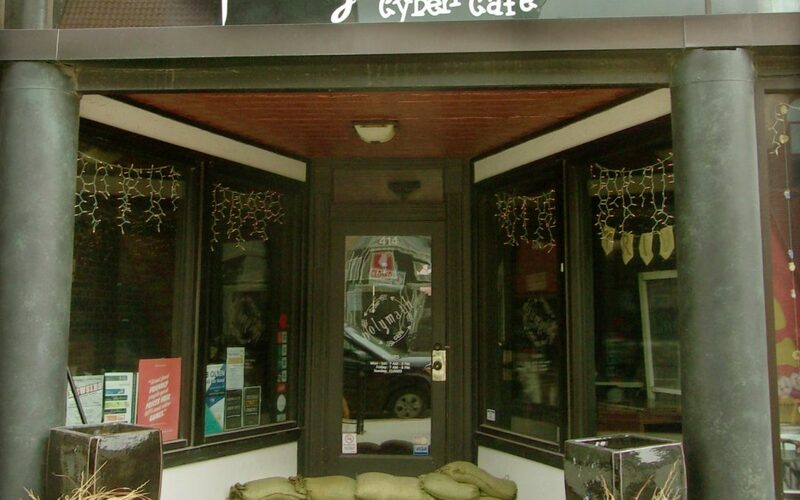 The results so far are breathtaking and make our downtown feel warm, fun, and inviting. Donations were also received for the first Downtown Fall Festival, that took place the weekend of October 5-7, 2018. If you’d like to join the team behind the Fremont Downtown Development Group, just email us and express your interest. We’ll be in touch soon to talk with you one-on-one. First Annual Downtown Fremont Fall Festival A Success! The first annual Downtown Fremont Fall Festival, October 5-7, 2018, was a big success and will become a wonderful annual tradition. It was a busy weekend with a full schedule and, while the weather made some activities a challenge, we didn’t give up and everyone who attended had a great time. The Farm-to-Table Community Dinner was well attended and a great way to unofficially kickoff the weekend’s events. Thanks to Rogers Tent and Awning for the tent that kept us all dry and comfortable; Midland University’s Arts Department for the lively jazz music; a delicious meal, featuring brisket donated by our downtown grocery store, Brady’s Meats and Foods, and prepared by the talented chefs from Midland University’s Fresh Ideas group; and mouth-watering desserts prepared by our very own Evelyn Stewart. The White Light City Film Festival was a welcome addition to the weekend. After a day of filmmaking workshops on Friday, the film festival held its kickoff party that night at the May Brothers Building. During that event, Marianna Simmons was honored with a tribute to her late husband, Ray, for the work they have both done throughout the years for our community, and for getting many cherished buildings in Fremont listed on the National Register of Historic Places. Their dedication and love for Fremont and its residents has made “The White Light City” a name we will never forget. The film festival continued on Saturday and Sunday at Midland University’s Eppley Auditorium and the Milady Coffeehouse downtown, screening 25 films from filmmakers in 8 countries, along with the films created this year by students at The Digg Site Productions‘ Film It Camps. The Artisan Market had record crowds on Saturday and allowed those who attended to start their Christmas shopping early. Pancakes in the Park was a fun way to start the day—with some yummy breakfast before shopping! The Pianos on the Streets project added a lot of creative art and sounds to our sidewalks. The first ever White Light One Mile Run was a blast! Over 60 runners participated, and the winner, Tristan Nelson, completed the downtown course in just over 4 minutes and 20 seconds—WOW, that’s impressive! The weekend’s activities wrapped up on Sunday evening with the White Light City Film Festival Awards and the White Light City Dedication to Marianne Simmons. Everyone in attendance joined Marianne outside while she had the honor of flipping the ceremonial switch to turn on the new white lights adorning the buildings in downtown Fremont. We planted a seed this year with this first Downtown Fremont Fall Festival. Many people—your friends and neighbors—put their hearts and souls into this weekend. This seed will require care and nurturing in order for it to grow. We need more people willing to step up and get involved in organizing all the aspects of the weekend. If you’re interested in helping to organize next year’s Downtown Fremont Fall Festival, just reply to this email and let us know. Or watch for an announcement about the 2019 Fall Festival Committee that will start working sometime in March or April 2019.